This cute fruity gift contains yummy bananas, crisp apples, juicy pears, plump red grapes and a sweet pineapple. The hand-held wicker basket is adorned with a pretty ribbon bow. Ideal for tricky-to-buy-for people, or as a “thank you” or “get well”, this gift will be a welcome surprise for someone special. 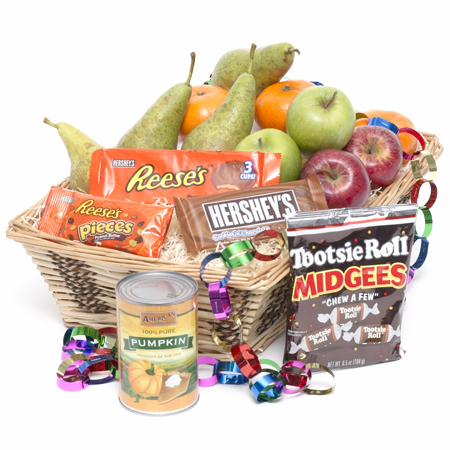 A tempting collection of fruit & candy make this an ideal gift for Thanksgiving. It even includes pumpkin for a pumpkin pie! Let those you love know that you are thinking of them at this special time of year.